The railway line to Da Lat was one of the finest feats of colonial engineering in Vietnam. Plans to build the Da Lat Railway Station were laid tabled at the turn of 20th century but construction did not commence until 1932. There was no point building a railway station without a railway line to get there and that was quite a challenge considering the rugged terrain and precipitous slopes. The station has been recognized as a national cultural site and is very much a symbol of French Indochina. Today the only train trip you can take is the relatively short 7km tour that circumnavigates Da Lat, but the views from the train will help give you a sense of what the engineers achieved. After the French occupied Vietnam, as part of the colonialists ‘mission civilastrice’, major infrastructure projects were initiated. The French installed electricity power stations, built French-style buildings as well as roads, parks, canals and of course a rail system. In the early 20th century, Paul Doumer, the French Governor-General of Indochina from 1897 to 1902, approved the construction of a railway line from Thap Cham in Ninh Thuan province to Da Lat at a cost of 200 million franc. The colonialists hired Swedish engineers for the job, who had experience at building zigzag railways for use on steep slopes. Although the initial survey was conducted in 1898, construction of the first phase running from Thap Cham to Song Pha, just 38 kilometres, only commenced in 1908 and took seven years to be completed. During the second phase the railway line was laid down from Song Pha to Eo Gio, just 10km as the crow flies, but it had to run over the vast Ngoan Muc pass. Work on the railway from Thap Cham to Da Lat continued until 1932. The last stretch was said to be the hardest as it traversed the Lam Vien Plateau, 1,500m above sea level. 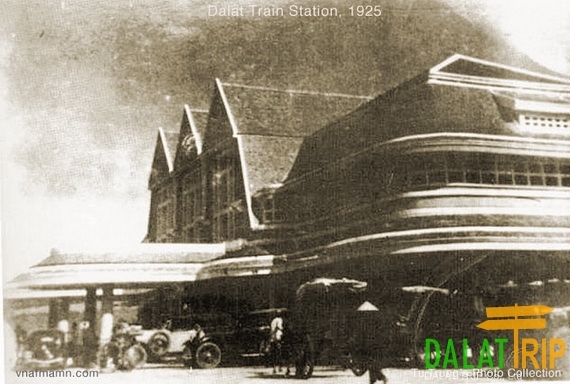 The construction of Da Lat Railway Station was subsequently completed in 1938. The railway station was among the first colonial-style edifices to be built in the area. It is a stunning piece of architecture, and the largely French style is complemented by architectural gestures towards the cottage style of ethnic minorities from the Central Highlands. Right in the middle if its façade three high, pointed roofs cut a striking shape against the sky. Under the central roof sits a large clock, which has been restored in recent times. The front of the building features a porte-cochere, supported by two rows of columns, twelve in each row. In colonial times two trains ran daily from Da Lat to Nha Trang and from Da Lat to Saigon, now Ho Chi Minh City. Each train would comprise three compartments for passengers and one for goods. Most passengers were French citizens or Vietnamese officials. The journey from Da Lat to Saigon took half of a day. 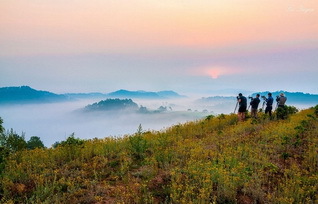 With solid road and rail links Da Lat quickly became a popular holiday spot as people came to make the most of the city’s temperate climate and stunning landscapes. European style villas mushroomed up and the city was nicknamed “Little Paris”. By 1975 the railway line had been completely abandoned. Decades of war had taken their toll on all of Vietnam and restoring the rail link from the north of the country to the south took precedence. What was left of the Da Lat railway line was ripped up and a number of locomotives made by Fucca in Switzerland were sold back to the manufacturer. But in 1997, as Vietnam’s economy began to flourish and tourism industry was starting to thrive, the seven-kilometer railway tour around Da Lat city was initiated and has proven to be highly popular. The railway station was also restored. You can find vintage post boxes and time-tables still fixed on the walls and antique chairs and tables in the waiting rooms. Outside there’s an original Black Prairie steam engine which was manufactured in 1930 in Germany. 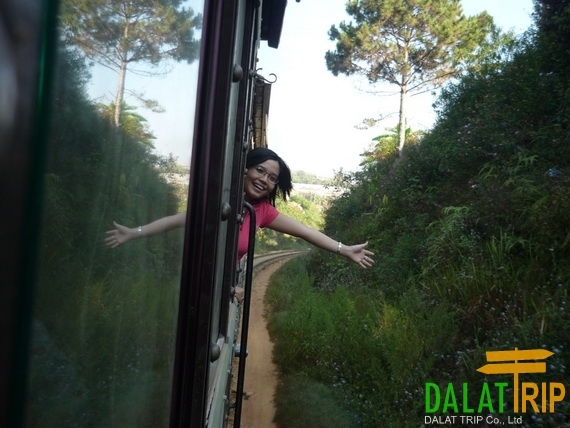 The tour, which runs from Da Lat Railway Station to Trai Mat, has now run for a decade. It’s worth taking for the spectacular views. This is Da Lat, the flower capital and fruit farm of Vietnam. All around the city you can spot orchards, rolling fields of vegetables and flowers, pine trees and lakes. When the train stops at Trai Mat station, you can stroll around and visit the local market or Linh Phuoc pagoda. At the market you can find tones of fresh vegetables and fresh fruit. A punnet of cherries and strawberries is the perfect accompaniment for the rest of the trip. 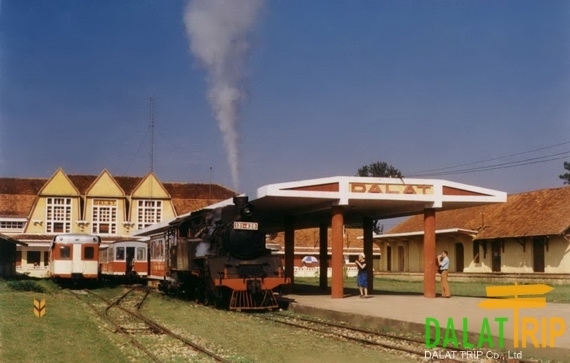 Dalat railway station was designed by architect Reveron with Ang-normand architecture style with was affected the modern style. Then architecture Moncet designed some more details and supervised the construction. It was built in 1935 and finished in 1938. 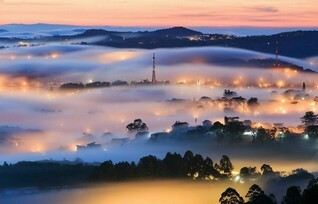 This is the unique and beautiful construction of Dalat. The station is located on a flat anf wide land. It has 66m in length, 11.5m in width and 11m in height. It is a symmetrically arranged house which has a main hall in the middle (37m x 10m) and some small rooms in two sides. It was well-decorated with a lot of colorful windows which made the house bright. The waiting-room has a large space. 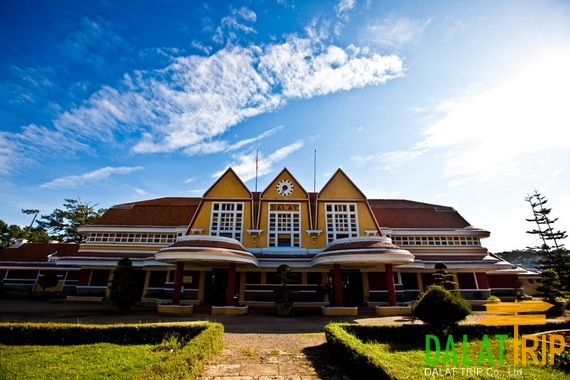 Dalat railway station is one of the most beautiful and original architecture works of Dalat and Vietnam. Previously, it was one of the most beautiful Railway Station of Indochina. On 28 December, 2001 it was recognized as National Architecture Relic. The guard asked me for 5000 dong under the table to let me just approach the building. So I’ll leave the city without admiring it. The steam locomotive at Dalat station was built in Japan not Germany. It is a Vietnam Railways 131 class and came to North Vietnam via China in the 1950’s. It’s Japanese designation is C12 class. This locomotive has probably never run on the line even to Trai Mat. 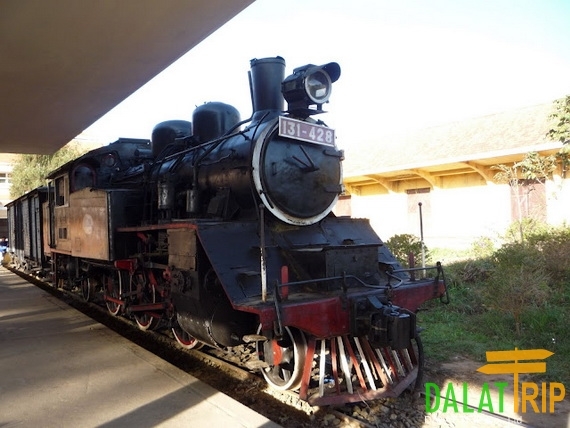 The actual locomotives that were used on the Dalat -Thap Cham line were removed to Switzerland some years ago. an updated information, thank David!